^ Duffy, Seán (2007). "Henry II and England's Insular Neighbours". In Christopher Harper-Bill. Henry II: New Interpretations. Boydell Press. pp. 132–133. ^ Crooks, Peter (2005). "Anglo-Irish Relations". In Seán Duffy. Medieval Ireland: An Encyclopedia. Routledge. p. 27. ^ a b Duffy, Seán (2007). "Henry II and England's Insular Neighbours". In Christopher Harper-Bill. Henry II: New Interpretations. Boydell Press. p. 138. ^ a b Perros, Helen (1995). 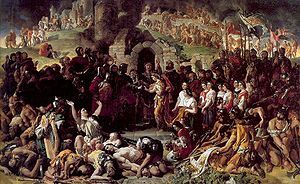 "Crossing the Shannon Frontier: Connacht and the Anglo-Normans". In T. B. Barry. Colony & Frontier in Medieval Ireland. A&C Black. pp. 118–119. ^ Duffy, Seán (2003). "John and Ireland". In S. D. Church. 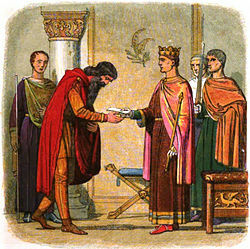 King John: New Interpretations. Boydell & Brewer. pp. 225–227. Martin, Francis Xavier (2008). "Chapter 2: Diarmait Mac Murchada and the coming of the Anglo-Normans". In Art Cosgrove. A New History of Ireland, Volume II: Medieval Ireland 1169–1534. Oxford University Press. Martin, Francis Xavier (2008). "Chapter 3: Allies and an overlord, 1169–72". In Art Cosgrove. A New History of Ireland, Volume II: Medieval Ireland 1169–1534. Oxford University Press. Martin, Francis Xavier (2008). "Chapter 4: Overlord becomes feudal lord, 1172–85". In Art Cosgrove. A New History of Ireland, Volume II: Medieval Ireland 1169–1534. Oxford University Press. Flanagan, Marie Therese (2005). "Anglo-Norman Invasion". In Duffy, S. Medieval Ireland: An Encyclopedia. New York: Routledge. pp. 17–19. ISBN 0-415-94052-4.